« Jelly Shoes. Good or Bad? One of the most commented upon posts I’ve made on this site has been the one about the old kiddies sweets Galaxy Counters. It seems many people have missed this old sweetie, and the good news is that Mars have listened, and are bringing them back! Galaxy Counters were originally aimed squarely at the kids market, and were a competitor for Cadbury’s Buttons. For me, Galaxy Counters just had the edge, mainly because each one had a little number printed on it, which for some reason made eating them a lot more fun. I guess it was the same feeling you got when opening a packet of Smarties, to see which letter was on the plastic cap (sadly this little bit of fun has also died out now). The relaunch of Counters is due for April/May 2010 (however, there are reports of some branches of Asda already stocking them) but don’t go looking for them in their old white packets with the animals on. No, Counters have been turned into a more grown up sweetie now, coming in those pouches that you tear the top off to get to the yumminess within and styled with the same brown and cream look that other Galaxy products have. Aiming them at adults was definitely the right thing to do, as all us nostalgia freaks will descend upon them like waves, and we won’t be disappointed as they have also increased in size too. If you’re a lover of Galaxy milk chocolate then you’ll know what to expect – basically it’s a Galaxy Minstrel without the crispy outer shell. Yum! The only thing missing from the new version is the lack of a little white number, but that’s no great loss I suppose. 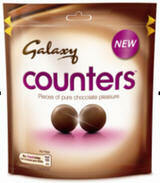 If you’re unable to track them down in the shops then why not try entering our competition to win a bag of Counters. It may not be a big prize but it does seem to be a much sought after one. 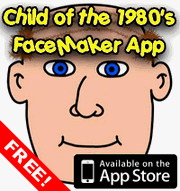 Follow this link to enter – all you have to do is fill in your name and e-mail address and tell us what you’re favourite memory of the Eighties is. This entry is filed under Reviews, Sweets and Snacks	and was posted on April 7th, 2010. You can follow any responses to this entry through the RSS 2.0 feed. You can leave a response, or trackback from your own site. Asda are selling them, got a packet today!! Soooooooooo good!! I soooo loved galaxy counters when I was younger and was so excited whenI went into my local co-op and seen them on the shelf the original packet was white with a girrafe on the front.